Grow your career with ATS! 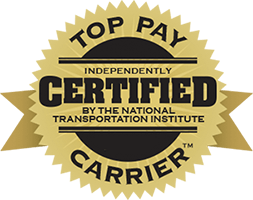 Our over-the-road flatbed specialized Company Drivers earn top-of-the-industry pay. During our NEW Upside Pay pilot program, our Van Drivers improved their pay to 68¢ per mile on AVERAGE! Enjoy newer equipment, consistent miles, better home time and the RESPECT you deserve. PLUS, get $1,000 weekly MINIMUM guaranteed for your first four weeks! After that, you'll earn CPM or 23% of Operating Statistics revenue - whatever earns you MORE! One of the lowest turnover rates in the U.S. with an average driver tenure of five years!